Frustrated that those fairway bunkers on the fifth appear to have an insatiable appetite for your balls? Well, you could of course ease off the gas on the tee, land short, and then safely glide over them with an iron. Sadly too often golfers choose the zero option and opt to go for more power in a futile effort to prove that no pesky sandtrap is going to make a fool out of them. More often than not, this need for speed, or more accurately power, translates into attempting to use brute force to get where you want to be – big mistake. Hitting the ball harder and, therefore, longer requires attention to both the efficiency of your swing and the amount of controlled power that you harness to every element of it. Notice the emphasis on control there, because simply gritting your teeth, opening your shoulders and straining every sinew is at best only going to lead to a very bad shank. In reality, you could end up hurting yourself or a playing partner with either the ball or a flying club – that’s no way to play golf. So let’s look at the physical side of your swing i.e. how you can step up to the plate and apply more power. Basically this means greater fitness by tuning up both the upper and lower body so that they can give that little more power but in a controlled way. So, first off, the upper body: this means the forearms, shoulders and back, together with the core area around the abdomen. Speak to one of the personal trainers at your local gym and ask them to draw up an exercise programme that will address these areas. 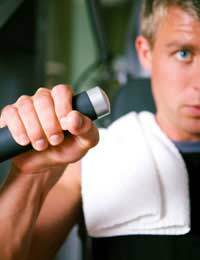 The safest way to build some muscle is by using the machines – free weights require a much greater degree of technique in order to avoid injury. The same is true of the lower body where stronger calves and thighs will offer both greater power and a more solid base for the swing. Don’t forget the work that the knees are asked to do – building up the muscles that surround them will provide greater support and lessen the risk of any ligament damage. Following a progressive programme of weight training will increase your physical ability to hit the ball harder, but you should also be aware of the benefits greater flexibility will bring. Beefier forearms or quadriceps are all very well, but their efficiency will be impaired if you are too stiff. So think about adding a little holistic discipline into your training programme through some Pilates or Yoga. It is likely some male players will pull a face at this point, probably because they are in reality rather frightened by the prospect of joining a class they think is very much geared towards women. This could not be further from the truth. But if fear is the key to preventing you signing up for a taster session, think about the potential benefits it could bring to your game. Either of these disciplines can offer greater core strength, as well as instilling better balance. They can also enhance the mental side of your game by reducing stress and allowing you to better handle high-pressure situations. In the rush to get to the tee and see the benefits of your increased physical prowess, don’t forget to warm up prior to stepping out on the course. You don’t want a stress or strain to stop you in your tracks; make sure your body is ready to apply that explosive power to that first tee-shot. It shouldn’t be long before those troublesome fairway greens are no longer on the radar.